The Parliament of the World’s Religions is the world’s largest and most diverse interfaith gathering, which happens every four years in different cities, involving over 10,000 people from over 200 religions and spiritual traditions gathering in mutual respect and working together to solve Humanity’s problems such as climate change, war, poverty, sexism and racism. This global stage is a perfect opportunity to introduce the ayahuasca spiritual movement, at a time when ayahuasca ceremony facilitators are suffering religious persecution because the tea is defined as illegal in most countries. Furthermore, the indigenous ayahuasca spiritual traditions have profound spiritual wisdom, and deep connection with Mother Nature, which are precisely the positive influences that Western society needs in this critical era. 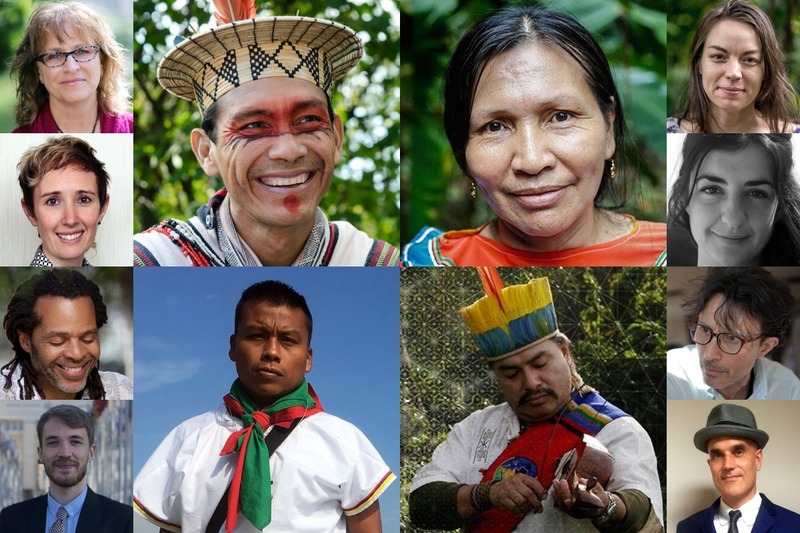 Never, since the Parliament of the World’s Religions began in 1893, have indigenous Amazonians attended: now I am asking for your support to bring 4 indigenous spiritual leaders from 4 ayahuasca traditions of Brazil, Colombia, Ecuador and Brazil to attend the Parliament in Toronto, November 1-7. These indigenous ayahuasceros will be supported by a team of 8 key players in the global ayahuasca spiritual movement, including representatives of Santo Daime and ICEERS, who will be speaking to the Parliament’s interfaith community about ayahuasca ceremonies as a religion / spiritual practice, and about the spiritual healing and medicinal value that people receive. While it would be impossible to fully represent the massive cultural diversity of all the ayahuasca spiritual traditions, there is a team of 12 ayahuasceros going to the Parliament of the World’s Religions to share their knowledge and express their spirituality - in the hope that this mission will benefit the wider community. Benki Piyãko is the spiritual leader and a Pajé of the Asháninka people of Brazil. Elena Valeria Vasquez is a Maestra Curandera and traditional artist in the Shipibo tradition of Peru. Miguel Evanjuanoy Chindoy is a community leader of the Inga people, follower of yagé medicine, and spokesperson for the Union of Indigenous Yagé Medics of the Colombian Amazon. Tii Arutam Tuntiak is the Chief Uwishin & spiritual leader of the Shuar people of Ecuador. Vicki Kraft of the legally-authorized Santo Daime Church in Los Angeles USA will be answering questions about her religion, and Ben Meeus (a Belgian legal scholar) will be representing the freedom of religion interests of European Santo Daime Churches. Tony Moss (an Afro-American musician and activist) will be advocating for the recognition of “neo-shamanic” ayahuasca ceremonies as legitimate religious practices, and for greater inclusion of people of colour into the ayahuasca community. Riccardo Vitale is an Italian Anthropologist and activist, working for indigenous rights and health in Colombia. Andrea Langlois (a Canadian activist who is now Communications officer at the International Center for Ethnobotanical Education, Research & Service: ICEERS) will be explaining the complex legal status of ayahuasca ceremonies around the world, and presenting strategies for the legal authorization of safe and sacred ayahuasca ceremonies. Débora González (a Spanish Psychologist and ICEERS researcher) and Benjamin Mudge (an Australian Psychiatry PhD candidate) will be explaining how ayahuasca ceremonies are a unique form of spiritual healing that has profound therapeutic potential. Tanya Kammonen (a Canadian naturopathic doctor that has moved to Peru in service to ayahuasca spirituality) will be discussing how Westerners integrate indigenous spiritual traditions into their lives. This is the first time that indigenous spiritual leaders from the Amazon will be attending a Parliament of the World’s Religions, since it began in 1893. The Santo Daime and UDV religions are now legally authorised to import and distribute ayahuasca tea in Canada and USA, as well as Brazil etc, but the indigenous tribes from whom these Western religions learned how to use the tea are prohibited from practicing their religion here. There have been dozens of arrests around the world, involving indigenous spiritual leaders being legally persecuted for practicing the spiritual healing traditions they have learned from their ancestors. We intend to address this issue and ask for the interfaith community to support the freedom of religion of indigenous ayahuasceros, in addition to the established ayahuasca religions such as Santo Daime and UDV. At 12.15pm on Friday 2 November, the four indigenous ayahuasca spiritual leaders and myself will be making a formal presentation called “Ayahuasca Spiritual Traditions”. Each indigenous spiritual leader will speak about their people’s spiritual knowledge and about the unique perspective their wisdom offers to the interfaith community. Never, since the Parliament began in 1893, have indigenous Amazonians spoken here. I will also be presenting general information about ayahuasca and the spiritual healing can provide when drunk in sacred ceremonial contexts. This will be a multimedia presentation, with speaches, projected photographs and music. The presentation will conclude with singing of sacred ayahuasca songs from the Asháninka, Shuar and Shipibo people, as well as a Santo Daime Hino and a contemporary ayahuasca song. The Parliament organizers have given us a big room to make this presentation, in acknowledgement of the historic significance of this moment, as well as the popularity of ayahuasca. There will be a large “Ayahuasca Spiritualities Booth” located in the Exhibition Hall. This booth will be a focal point where the 10,000 attendees of the Parliament will be able to come and find out about ayahuasca spiritual traditions, from people who facilitate ceremonies - as well as people who do academic research and advocacy for them. This booth will be non-partisan, open and inclusive for all those who consider ayahuasca to be a Sacrament / sacred medicine for their religious / spiritual practice. Information brochures from ayahuasca retreat centres and Churches will be available, as well as general information. There will be an ayahuasca art exhibition, and a sacred interfaith ayahuasca altar at the centre. This booth will be an ongoing public outreach / educational resource that the team will be taking turns to operate. In the ancient spiritual traditions of indigenous Amazonian people, spirituality, healing, cultural survival and protection of Mother Earth are intertwined, and their religious sacrament is called a “medicine”. Ayahuasca has been scientifically demonstrated to have anti-depressant effects, when used correctly in sacred ceremony. At this historic moment of environmental destruction, humanity needs an awakening, and many agree that safe and sacred ayahuasca ceremonies can inspire a awakening of consciousness and more sustainable development models . I have been working to get ayahuasca legitimized in the interfaith community since the 2010 Parliament in Melbourne. I am pleased to say that the Parliament organizers are very progressive and inclusive, and they have welcomed ayahuasca traditions with the same respect they give to mainstream religions. The 2015 Parliament in Salt Lake included a presentation called “Introducing Ayahuasca Religion”, which I made together with Madrinha Jessica Rochester and Mestre Jeffrey Bronfman: leadership from the Santo Daime and União do Vegetal ayahuasca religions of Canada and USA respectively. Now I am organizing to have the ancient indigenous traditions of ayahuasca spirituality properly represented at a Parliament for the first time. I feel passionately about the need for legal authorization of safe and sacred ayahuasca ceremonies, because my life has been positively transformed discovering ayahuasca 11 years ago, and I know that there are thousands of people seeking this spiritual healing modality who cannot access it because of the current legal prohibitions. I believe it is time for the interfaith community to support the religious freedom of ayahuasca spiritual traditions and, therefore, I have taken the initiative to organize these events. I have attracted a strong team, we have been blessed to be invited to participate (less than 10% of applicants were invited), all the plans have been made, and all the logistics are flowing smoothly... however I have had to take a leap of faith (with credit card in hand) that we will have the financial resources to manifest this vision into reality. I am honoured to be investing my time and energy into this historic project - now I need the global ayahuasca spiritual community to understand that this Sacred mission to Toronto is for all of us, and to fund it accordingly. This project is organized by Benjamin Mudge, who is doing a PhD about ayahuasca in the Psychiatry Department at Flinders University, and who has been healing and learning in the Santo Daime and other ayahuasca traditions since 2007. Mudge was the first person to discuss ayahuasca at the Parliament of Religions in 2009 and in 2015, and has been planning and organizing this group. He is the official presenter at the Parliament of the World's religions, and is organizing the team as well as introducing them on stage, and has been building relationships with them all during the year and beforehand. All funds raised through GoFundMe are going through his personal bank account, but are all being spent on the travel and accomodation expenses of the ayahuasca team, as well as the Parliament registration tickets, and the Exhibition Booth. No one in the team is getting paid for their involvement in the Parliament of Religions, and no one is receiving these GoFundMe funds as personal income. All funds raised in this GoFundMe campaign will be spent on the expenses associated withe attending the Parliament of Religions in Toronto, October 30 - November 7. * Tii Arutam Tuntiak travelling from this village in the Amazon jungle in Ecuador. * Elena Valeria Vasquez is travelling from her village in the Amazon jungle in Peru. * Miguel Evanjuanoy travelling from this village in the Amazon jungle in Columbia. Andrea Langlois is the Communications and Development Officer at the International Center for Ethnobotanical Education, Research & Service. ICEERS is dedicated to 1) the integration of ayahuasca, iboga and other traditional plants as therapeutic tools in modern society, and 2) the preservation of the indigenous cultures that have been using these plant species since antiquity on their habitat and botanical resources. Andrea is a communicator, facilitator, and community-based researcher and is passionate about policy, discourse, and social change. Andrea has been involved in research on media coverage of drug policy issues, social dimensions of health (such as housing and stigma), and psychedelic drug policy. She is a research affiliate with the University of Victoria’s Institute for Studies & Innovation in Community-University Engagement and sits on the advisory board of the Centre for Addictions Research of British Columbia. Ben Meeus got in contact with Santo Daime when he was 16 years old. From there on, he pursued a Master’s degree in international and European law from the Free University of Brussels. During his law studies, he focused mainly on land rights issues in Colombia. He then obtained a second Master’s degree in Latin American Studies at the Centre for Latin American Research and Documentation (CEDLA) in Amsterdam. During that time, the religious use of ayahuasca was at the verge of being prohibited in the Netherlands. Therefore, he wrote a thesis on the transnationalization of Santo Daime and the legal issues related to the religious use of ayahuasca. In order to unite legitimize churches and seek cooperation with public authorities, Ben became Board Member of the “Centre for the Legal Assessment of the Religious and Ethical Integrity of the use of Ayahuasca” (CLAREIA) in the Netherlands. Benki Piyãko was trained by his grandfather to be a Pajé in the Asháninka tradition: someone who possesses a deep knowledge of traditions and healing and uses this knowledge to help his community. He and his brothers became leaders of their community’s non-violent resistance to the invasion of their ancestral land in Brazil. Benki participated in the ECO92 Environment and Development Summit, and there learned modern sustainability techniques. He is an internationally- renowned political and spiritual leader. Débora González is a Psychologist, and a researcher at the International Center for Ethnobotanical Education, Research & Service. She is co-author of several scientific papers and book chapters. She also conducted research into the subjective effects of ayahuasca, salvia divinorum and was involved in the long-term ayahuasca research project in Brazil with Santo Daime Ayahuasca users. With ICEERS she is currently leading an online assessment project on ayahuasca and grief and longitudinal research project conducted with Beckley Foundation at the Temple of the Way of Light on the long term effects of ayahuasca on quality of life, well-being and health. Elena Valera Vasquez is a Maestra Curandera in the ancient ayahuasca tradition of Shipibo tribe in Peru. She started training with plant medicines aged 16, studied at a modern nursing school, and then went deep into her ancestral tradition with guidance from Shipibo elders. Now she works as an ayahuasca Curandera at the Temple of the Way of Light, a fairtrade retreat centre that integrates Shipibo tradition with Western psychotherapy in a jungle setting. She is also a talented artist, working with acrylic and natural paint, and produces artworks depicting her ayahuasca visions as well as traditional stories and legends. Miguel Evanjuanoy Chindoy is a member of the Inga people, Putumayo, Colombia. Community leader, environmental engineer and follower of yagé spirituality since his childhood years. Miguel is an indigenous rights' activist and a spokesperson for the Union of Indigenous Yage Medics of the Colombian Amazon (UMIYAC). His work focuses on key issues such as: the role that indigenous spirituality and yagé medicine play in environmental management, territorial defence, indigenous governance, indigenous mental health, peace building and the reconstruction of the social fabric in war-torne Colombia. Riccardo Vitale is an anthropologist, with more than 15 years of working experience in Latin America. His research experience covers: human rights, humanitarian law, anthropology in armed conflict, internally displaced people, social movements and gender, indigenous politics, sustainable development, resilience, climate change adaptations and disaster risk reduction. In recent years he is been researching indigenous spirituality and the use of psychotropic substances as biotechnological tools of indigenous resistance, peace building and environmental conservation. He is currently a full time adviser for the Union of Indigenous Yagé Medics of the Colombian Amazon, working on organizational strengthening and political advocacy. Tanya Kammonen grew up in Canada and trained as a Naturopathic Doctor. Tanya has many years of experience with plant medicines in the Shipibo tradition, and combines her background in the biological sciences and medical training with a deep reverence for the world of plant spirits. She is now living in the Peruvian jungle, and is working at the Temple of the Way of Light as integration director, workshop leader and trainer. Tii Arutam Tuntiak is the Chief, Spiritual Leader and senior Uwishin (ayahuasca shaman) of the Shuar Nation of Ecuador. He was initiated as an Uwishin by the most renowned teachers of his tribe, and studied studied Philosophy and Psychology at University too. He was one of the founders of the Confederation of Indigenous Nationalities of Ecuador, the Organization of United Traditions, the Confederation of the Condor and the Eagle, and he represented South America at the delegation of indigenous elders who met the Dalai Lama. He now practices traditional spiritual healing with ayahuasca at the Shiram Yaa Ancestral Wisdom Center. Tony Moss is the founder of I.AM.LIFE, a non-profit event production company focused on interconnectivity. Tony has 20 years' experience working with ayahuasca, and is a public advocate for "right relationship" with plant medicines. As well as participating in Santo Daime and indigenous ayahuasca ceremonies, he is interested in the development of "neo-shamanic" ayahuasca ceremonies in Western cultural contexts. Tony advocates for the integration of, and full participation by, people of colour into the ayahuasca community. Tony's work is a synthesis of passions in art, spirituality & science, with emphasis on the evolution of human consciousness and potential. Vicki Kraft, MFT has been a community member and leader of the Santo Daime religion in Los Angeles, California for the last 19 years. In 2014, her church acquired a legal standing with the United States government and is registered with the Drug Enforcement Agency (DEA) to import Ayahuasca for her religious practice. She is a licensed Marriage and Family therapist specializing in treating individuals with trauma and psychedelic integration. She also is a co-therapist on the MAPS Phase III MDMA-assisted Psychotherapy for PTSD clinical trial currently being conducted in Los Angeles.